Once established, many varieties will persist as short-lived perennials in areas with moderate winters. Mix a light application of a balanced organic fertiliser into the soil prior to planting. Gaillardias only need a modest supply of nitrogen. The strongest bloom time is midsummer to autumn. Gaillardias team up well with black-eyed susans and other bright flowers. Colours include red, yellow, and many bicolours. Sow gaillardia seeds atop moist seed starting mix and gently press them into the surface. You also can sow seeds where you want the plants to grow at about the time of your last spring frost. In most areas, gaillardia needs a head start indoors if the plants are to bloom well their first year. 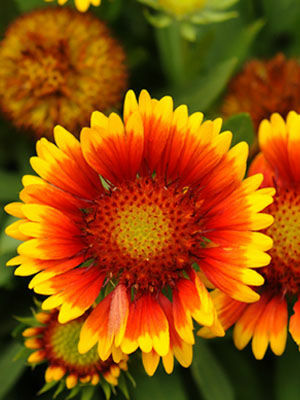 Gaillardia blossoms attract bees and butterflies, and the plants will bloom for eight weeks or more if old flowers are removed. Gather blossoms to use as cut flowers just after they open. If you like dried flowers, harvest some of the older flowers and dry them after the petals have been removed by hanging them up in a dry, well-ventilated place. Gaillardia has few pest problems.